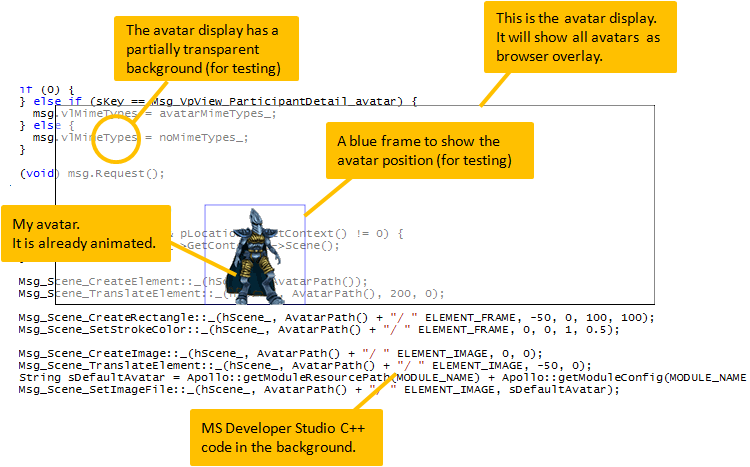 I started programming the avatar display. The image shows my test avatar on a test scene. The test scene uses the scene graph module. The avatar is already animated. An animation module decodes the old animation format and the animated GIF files and feeds images to the avatar display. There is no web browser in the background, yet (the background is my Visual Studio). The avatar does not enter a real chat room. This is still a test. The overlay is created by a test function. The test function creates the avatar, assigns an animation, etc. The reason is, that I can develop the display quicker, more reliable, and without network connection. I do not have to open a browser and enter a chat room. The test just pretends that there is a browser and an avatar. Later, when the avatar display works, then it will be connected to a browser and operated by a real chat room. Congratulations,first avatar,we are all waiting! October 31, 2010 at 2:49 a.m.